Work It Out curated by Eric Heist, Momenta Art. ​3 Pieces, 2 at 39” x 50” x 24” each; one at 42"x24"x24"
​Our proposal to expose hidden debt in the art market includes a series of interventions in commercial galleries and art fairs. 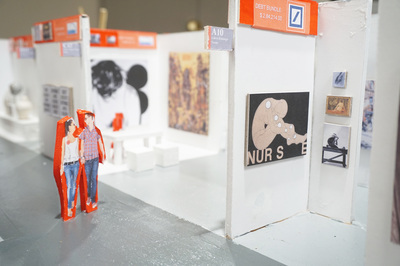 We intend to insert a new narrative into art fairs by exhibiting “bundles” of artwork by indebted artists on auxiliary walls that can be attached to existing structures. In commercial galleries, we intend to hang the work of bundles of indebted artists between the studs of a typical gallery wall and behind an existing show. ​Recently shown at Momenta Art in Brooklyn, NY. 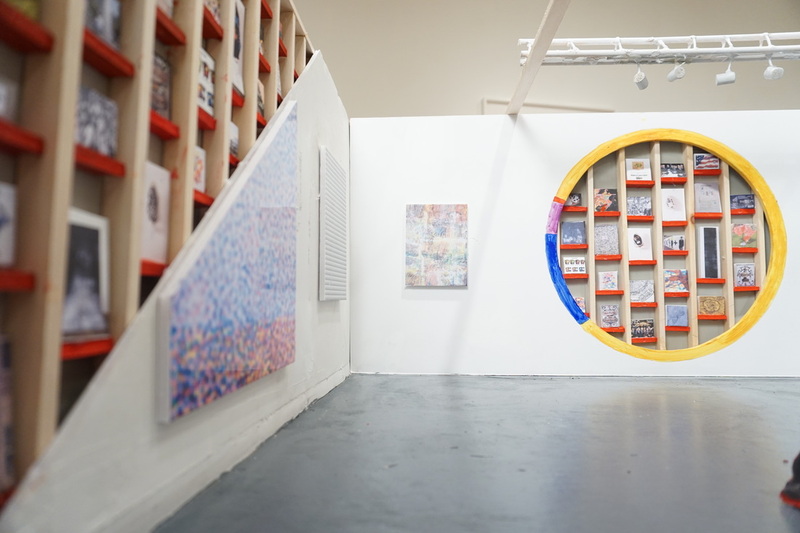 The group show, "Work it Out" also included artists Greg Sholette and Matt Greco, Nsumi Collective, Peter Fend, Huong Ngo & Hong-An Truong and Mierle Laderman Ukeles. 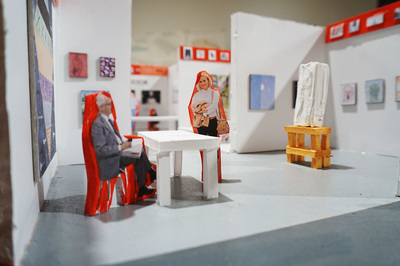 The installation included one proposal for a commercial art gallery, one for an art fair, and one table holding broadsheets explaining the project and printed for the show. 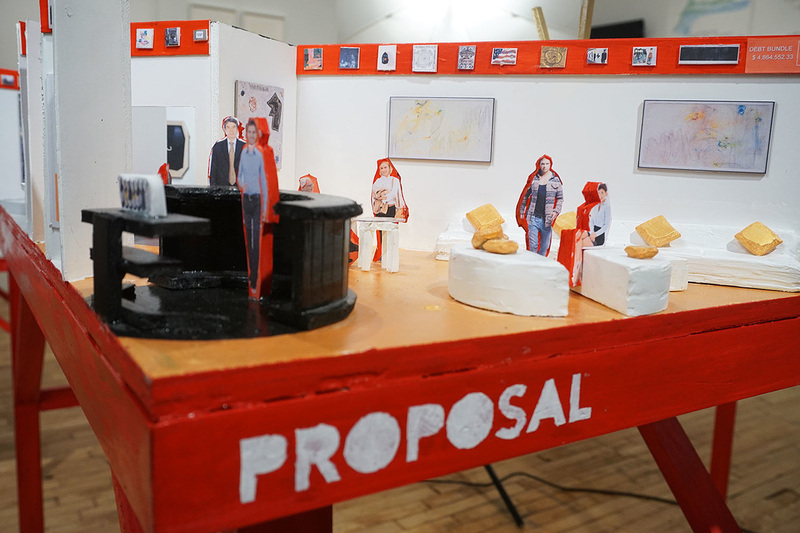 Creative Extraction: Why are Art Schools at the Vanguard of Unreasonable Debt Burdens? ​In recent years, we have witnessed many art school graduates snared into unpayable debt traps through the skyrocketing tuitions paired with low earning potential. 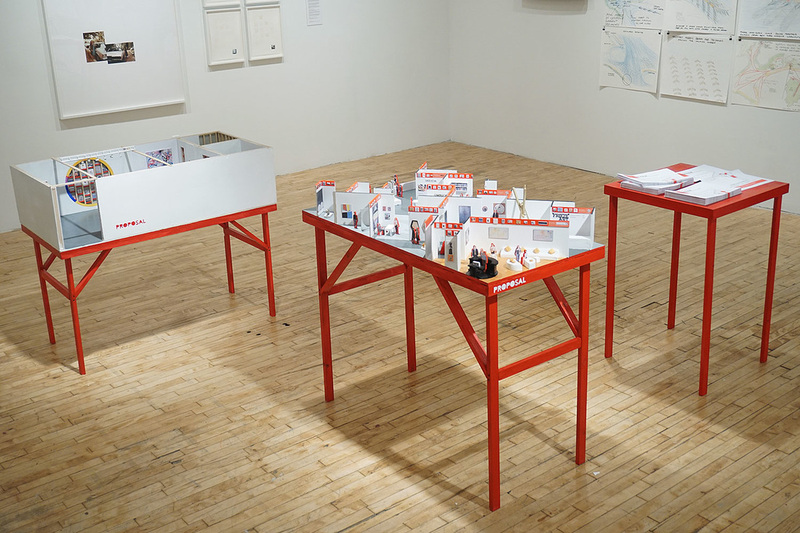 Debtfair by Occupy Museums, currently on view in the exhibition Work It Out, is a proposal for an alternative art fair that aims to alleviate the debt crisis in the Art World. While proposing a solution based on solidarity, Debtfair also examines the interconnections that exist between student debt, exploitative labor conditions in the art industry, and alliances between the art market and multinational banks and corporations. How does the “Art World,” whether willingly or unwittingly, take part in an inter-connected web of globalizing neo-liberal economy? 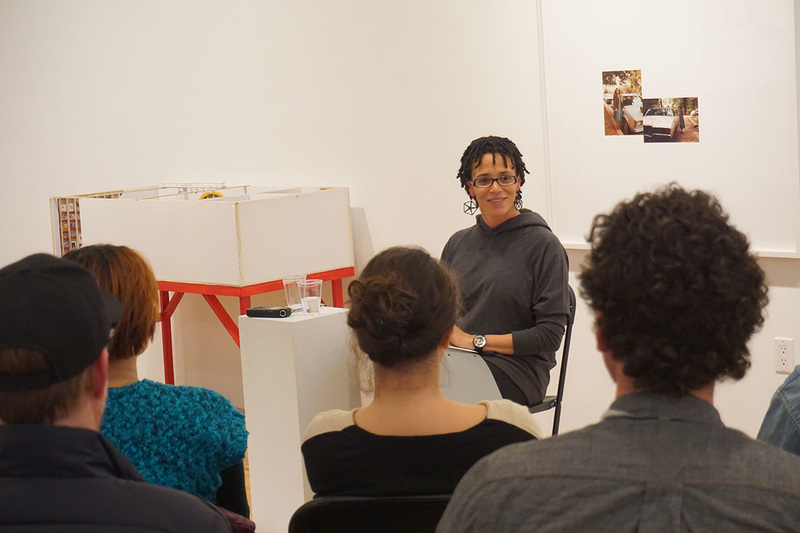 While the Art World frolics amid the markets of the Miami Basel Art Fairs, Occupy Museums invites artist and educator, Coco Fusco to introduce a less glamorous section of the Art World: an art education complex paralleled with global practices of labor exploitation, predatory lending, and the privatization of culture. We will discuss broader ranges of oppressive practices, including tuition hikes, predatory lending to students, and the increasing precariousness of faculty positions that parallels other service-labor.